Introductory prayer for every day:Omnipotent and everlasting God, You wanted San Cayetano to trust in your Providence and despise earthly things and You enriched him with abundant spiritual goods, grant that those who implore the graces of your Divine Providence are aided in their necessities by San Cayetano’Äôs intercession. We ask this through our Lord Jesus Christ. Amen. Glorious San Cayetano, you appreciated the healthful practice of prayer so much that your life was a continuous prayer, and to this beneficial exercise you dedicated particularly up to eight hours daily; grant us that we should be totally convinced that everything is reached by means of prayer and nothing can be gained without it and that all our prayers will be alive, faithful, reverently attentive, deeply humble, confident and perseveringly inexhaustible. Amen. (Conclude with the final prayer). Glorious Protector San Cayetano, whose love for Jesus in the Blessed Sacrament made you raise beautiful temples to Him, adorning them with magnificence, and exhorting the faithful to receive frequently the Holy Eucharist, teach us reverence to the Holy Sacrament and to receive It modestly to merit eternal life. Amen. My Glorious protector San Cayetano, whose singular devotion to Mary made you deserve her protection, particularly in the hour of your death when she sweetly said “Cayetano, come with me, my son is calling you”, intercede with this kind Mother whom we invoke during all the moments of our lives and this way She will attend to us now and at the hour of our death. Amen. My Glorious protector San Cayetano, staunch defender of the Faith against all attacks of heresy, discoverer of what was ailing the Church, grant that we appreciate the inestimable gift of faith, without which it is impossible to please God, and swiftly reject with firmness all errors. Amen. O Glorious Saint, you took so much to heart the virtue of hope that you rejected what the world had to offer and gave all your trust to God’s Providence to sustain your communities. Grant that we might live with the unshakable hope that God, through the merits of His Divine Son, will give us Eternal Life together with the means of obtaining it, and that temporary earthly goods will never serve as an obstacle to us in gaining it. Amen. San Cayetano my protector, I can see your chest bursting with the love of others and your heart coming out to save the poor and to fight sin. I beseech you, grant that we love God and our neighbour with all our hearts. O my Glorious Saint whose deepest humility made you give up all your worldly benefices from your priesthood, grant that God will not cease to look upon us because of our pride but that we will deserve His mercies through our sincere humility. My dearest San Cayetano, you who were patient and suffered all your life especially during the sacking of Rome when the foreign soldiers tortured you, grant us the patience to undergo the adversities of this life thus gaining our glorious crown in Heaven. 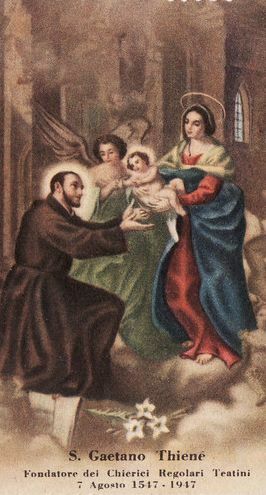 My Glorious Protector San Cayetano whose perfect chastity made you deserving Mary giving you Her Son Jesus to hold, grant that we will not stain our souls with sin and will guard our purity with Christian mortification. “Look down, O Lord, from Your sanctuary, from Your dwelling in heaven on high, and behold this sacred Victim which our great High Priest, Your Holy Son our Lord Jesus Christ, offers up to You for the sins of His brethren and be appeased despite the multitude of our transgressions. Behold, the voice of the Blood of Jesus, our Brother, cries to You from the cross. Give ear, O Lord. Be appeased, O Lord. Hearken and do not delay for Your own sake, O my God; for Your Name is invoked upon this city and upon Your people and deal with us according to Your mercy. Amen. This entry was posted in Novena and tagged jobs, Novena, prayers, seekers by sandra dipasqua. Bookmark the permalink.